Strollers are very helpful to parents: pushing your child on wheels is worlds easier than carrying them around. Double strollers, in particular, offer several benefits, making them well worth the investment. 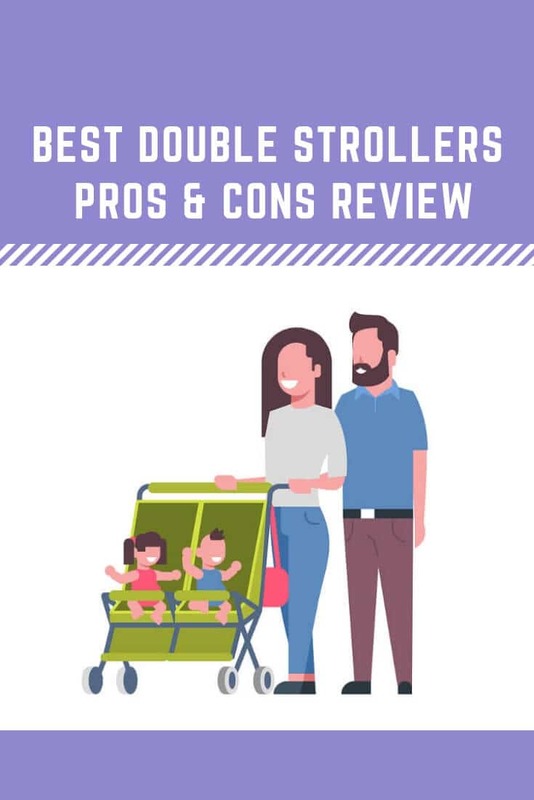 Why Buy a Double Stroller – Is a Double Stroller Worth It? If you’re a mom or dad of two small children, double strollers are a necessity. Even if your toddler can walk, odds are that they don’t walk well enough to go great distances. A mile to you is a mountain to them. When they grow tired, the stroller offers them a place to nap (or just sit back and enjoy the ride). 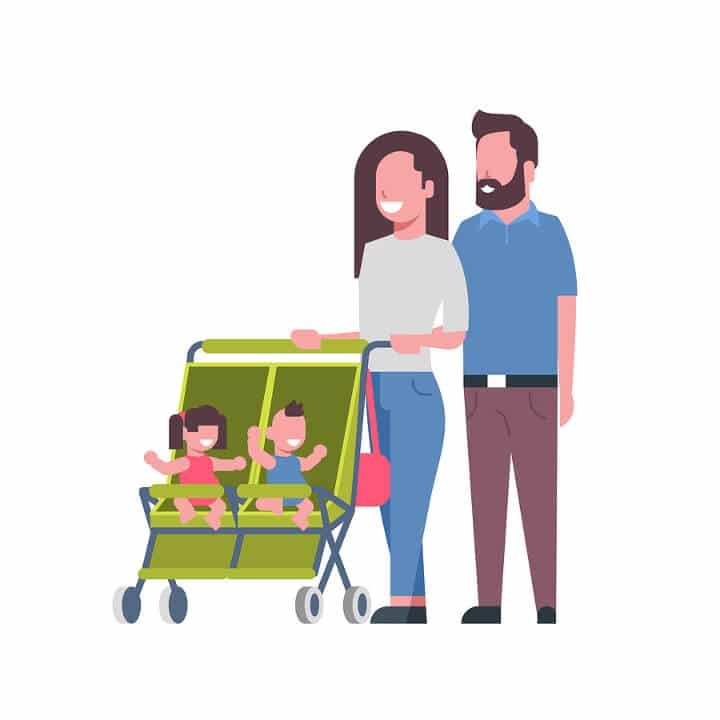 Double strollers also help keep your children safe – two and three-year-olds aren’t likely to stay right by your side, making the confines of a stroller a must-have. Chasing your toddler all over the mall might be good cardio (wear your Fitbit! ), but it comes with plenty of downsides too. Then there is the speed factor. What moves at a snail’s pace? Your child…especially when you’re in a hurry. Some toddlers walk slowly because they’re just learning; others are easily distracted and stop to examine everything. This may be okay on occasion, but – odds are – you don’t want your quick trip to the grocery store to turn into a five-hour trek. This stroller is equipped to hold up to 35 pounds in each seat. It comes with European-style canopies and a design that fits through most standard doors. The things parents like about this stroller are it’s very lightweight and easy to maneuver. It also folds up very compactly, allowing for easy storage. The sun canopies are another perk as they help shield children from UV rays. And there are ample places to put things. There’s even a holder for your travel mug of coffee (a.k.a, mommy’s sippy cup). The things parents don’t like include the seat adjustors – it can be difficult to get the seats to recline. The seat belts may also prove too flimsy for older kids. And the handles, if you’re tall, may be a bit short. This stroller comes with a reclining seat, large canopy, and extra storage. The easy standing fold makes it perfect for car travel or vacations. Among the pros is the assembly – it’s easy to put together with no tools required. It’s easy to push and steer as well with comfortable seats. And the canopy comes with a peek-a-boo hole so that you can see what your child is doing. Among the cons is the recline – though the seats do recline, they don’t go back far enough for some children to sleep. The child cup holders are also too small for many sippy cups to fit and the parent console keeps the canopies from folding all the way back. This stroller holds children up to 45 pounds and fits through standard doors. It allows you to adjust each seat and footrest independently and it has an enormous canopy for sun protection. In the “yay” column is the comfort – even tall children fit very comfortably. The storage baskets are also a draw as they offer ample space. It also features a deep recline as well as an extendable leg rest. In the “nay” column, the handlebars might be a bit tall for you if you’re on the short side. The stroller itself is heavy and difficult to heave into the obligatory mini-van. And the stroller doesn’t stand when folded. This stroller features a design with a reclining seat that accommodates infants and toddlers. The max weight is 50 pounds per seat, making it suitable for even some school-aged kids, and it comes with a height adjustable handlebar for both tall and short parents. The pros include the ease at which it pushes; you’ll have to go to the gym to get your workout. It has a sharp turning radius too! The canopies allow for nearly-complete coverage, there’s tons of storage, and it’s fairly lightweight. The cons include the recline – the seats don’t go all the way back and there is no cup holder (for parents or children). This stroller is versatile, compact, and able to carry up to 90 pounds total. It offers front wheel suspension, swivel lock wheels, and a foot rest. These features provide a smooth, comfortable ride while making the stroller simple to maneuver. The benefits of this stroller include the one-hand fold – anything that can be done one-handed is always beneficial to mom and dad. It’s also put together in minutes (even if your children insist on “helping”). And it’s easy to push and transport. The drawbacks are the seats. As is common in strollers, they don’t recline all the way. And the wheels, made of plastic, might benefit from rubber tread. This stroller holds children from 3-months until 45 pounds. It also has a parent organizer (where you can keep keys, wallets, phones, and coffee safe). The product features a universal car seat adapter, too. The benefits include the ride: it’s nice and smooth and doesn’t require much pushing. Even if you’re on rough terrain, it’s easy (this isn’t to say you should take it on a hiking trail – it’s more Magic Mountain than Mount Everest). It also steers well and is simple to assemble. The cons include the cup holders – they don’t hold much. The storage is similarly limited. The folding is a bit time consuming too – it requires a few different steps. This stroller is patented with quick-fold technology and offers a light-weight experience that’s designed to make even the bumpiest rides comfortable. Parents enjoy that it’s easy to push and has sun shades that go low enough to offer adequate protection. It’s also durable – use it for years without any issues. It reclines well too with seats that lay back almost fully. Parents don’t love that it’s a little bulky when folded. It also lacks a cup holder and has a limited amount of storage. The parent console is sold separately, another drawback. This stroller holds up to 40 pounds (per seat) and offers a very large canopy that protects against rain, snow, and sun. It’s made of water-resistant material and has handles for carrying convenience. The good includes the smoothness of the ride – even on rough terrain, it glides. The swivel child bars are also a plus as they help your older children get in and out of the stroller themselves. And there is ample storage room to bring along electronics for when children start going through iPad withdrawals (after ten minutes). The storage can accommodate a large diaper bag as well. The bad includes the lack of snack trays and cup holders. While you can purchase attachments, this stroller doesn’t come equipped. Some parents have also stated that the wheels could be a bit bigger. Strollers are a convenience of parenthood, allowing you to keep your kids safe, secure, and away from the candy store. They’re also a great way to carry diapers, sippy cups, toys, and the 108 other items that parents must take each time they set foot outside their homes. If you have more than one kiddo, double strollers are practically a requirement. Double the stroller and you’ll double the convenience.